Crosman Crusher Nitro Piston Air Rifle (.22 Cal) with 4x32 Scope - Hunting and Outdoor Supplies. * No spring fatigue even if you leave it cocked for hours. * Functions perfectly in cold weather. * Lasts longer than a metal spring. Featuring the patented Nitro Piston technology, the Crosman Crusher air rifle has reduced recoil and features a sound suppressing barrel shroud which results in 70% less noise than other break barrels. This makes the Crosman Crusher perfect for either backyard shooting or pest hunting. Plus the .22 caliber packs a bigger punch (21 ft/lbs of muzzle energy)!. With its rifled steel barrel, all-weather synthetic stock, two-stage adjustable trigger and CenterPoint 4x32 mm scope, the Crosman Crusher delivers power and accuracy in a contemporary package. 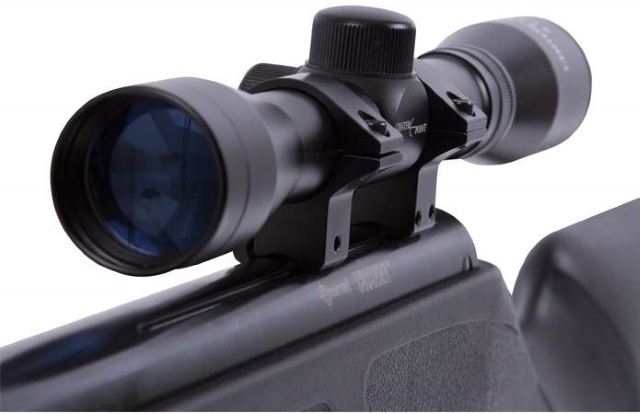 The CenterPoint Optics 4x32 scope included with your Crosman Cursher kit delivers a clear view of your target. 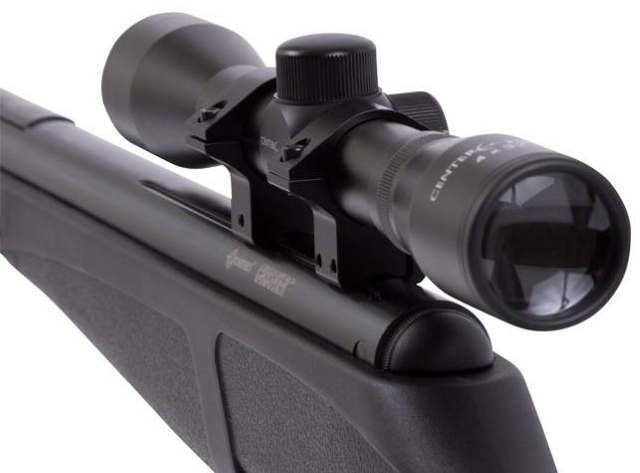 Many manufacturers mount special lower-quality scopes on their gun combos. This one is different. It's good, clear and will serve you well. Use your Crosman Crusher NP air rifle to dispatch those pesky little critters that invade your garden, yard and attic. From mice to squirrels and all sorts of vermin in between you'll be able to humanely dispatch invaders with one shot. * Lightweight rifle delivers serious knockdown power. * Comes with a CenterPoint Optics 4x32m Riflescope and mount. * All-weather black synthetic Monte Carlo stock. * 21 foot pounds of energy (fpe). * Crosman Nitro Piston powerplant. * Textured grip and forearm. * The air rifle on its own is 6.80 lbs. (the riflescope and mount add about 1.5 lbs. ).